Lock in a great price for NH Collection Palazzo Cinquecento – rated 8.8 by recent guests! I like the room size, quality of beds and the cleanliness. I came early before the check-in time they welcomed me and gave me the room straight away (most of the hotels don’t do that). The location is perfect just few steps from Roma termini train station and the room is noise isolated. The staff were friendly and helpful. The host Marta was amazing. She was very helpful and always smiling - she really just made everyone's day brighter and better. And the breakfast was great. It’s very close proximity to the train , bus and metero station. They staff was very polite and friendly . They even offered us a upgrade and made our stay more memorable and comfortable. The location is great if you are traveling by train, either coming or going; and very convenient since there is also a metro station. The bed was very comfortable! NH Collection Palazzo Cinquecento This rating is a reflection of how the property compares to the industry standard when it comes to price, facilities and services available. It's based on a self-evaluation by the property. Use this rating to help choose your stay! 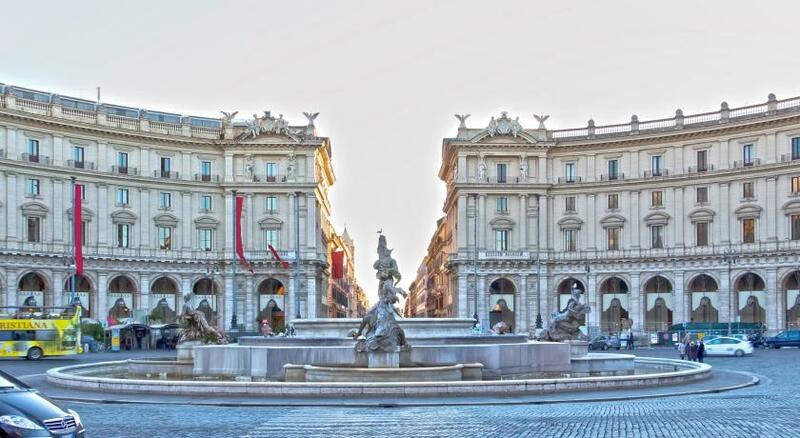 One of our top picks in Rome.Set in Piazza del Cinquecento Square in Rome, NH Collection Palazzo Cinquecento offers luxurious accommodations a few steps from Termini Metro and Train Station. A free fitness center and a rooftop terrace are featured. Each room and suite come with air conditioning, a mini bar and free WiFi. Some have a terrace and views of the surrounding extensive gardens with Roman ruins. Suites feature a seating area with flat-screen TV. Breakfast is served daily. Guests enjoy a bar and a restaurant that serves local dishes. Room service is also available. The Spanish Steps are a 25-minute walk from NH Collection Palazzo Cinquecento, while the Coliseum is 0.9 mi away. 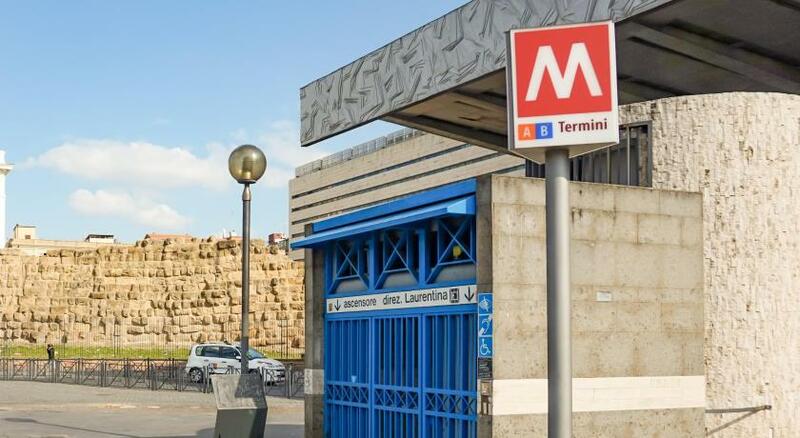 You can find links to all main attractions in Rome through the nearby metro. The property is member of Preferred Hotels & Resorts. When would you like to stay at NH Collection Palazzo Cinquecento? Offering free WiFi, this air-conditioned room features a mini bar and flat-screen TV with satellite channels. Larger air-conditioned room with hardwood floors, free WiFi, a 48-inch flat-screen TV with satellite channels, a mini-bar and a private bathroom with a hairdryer and free toiletries. Spacious air-conditioned room with a seating area, hardwood floors, free WiFi, a 48-inch flat-screen TV with satellite channels, a mini-bar and a private bathroom with a hairdryer and free toiletries. Air-conditioned junior suite with a seating area, hardwood floors, free WiFi, a 48-inch flat-screen TV with satellite channels, a mini-bar and a private bathroom with a hairdryer and free toiletries. Larger air-conditioned room with a terrace, hardwood floors, free WiFi, a 48-inch flat-screen TV with satellite channels, a mini-bar and a private bathroom with a hairdryer and free toiletries. Can accommodate an extra bed, subject to availability. Spacious, air-conditioned suite with a seating area, hardwood floors, free WiFi, a 48-inch flat-screen TV with satellite channels, a mini-bar and a private bathroom with a hairdryer and free toiletries. Can accommodate 2 extra beds, subject to availability. This air-conditioned room features a mini-bar, an electric kettle, soundproofing and a satellite TV. The private bathroom comes with free toiletries and a hairdryer. Free WiFi is offered. Offering views of the city, this air-conditioned room features a mini-bar and a flat-screen TV with satellite channels. The private bathroom comes with free toiletries and hairdryer. Free WiFi is included. Offering views of the city, this larger air-conditioned room comes with hardwood floors, a 48-inch flat-screen TV with satellite channels and a mini-bar. The private bathroom comes with a hairdryer and free toiletries. Free WiFi is offered. Offering city views, this air-conditioned suite comes with a seating area, hardwood floors, a 48-inch flat-screen TV with satellite channels and a mini-bar. The private bathroom comes with a hairdryer and free toiletries. Free WiFi is offered. The property is a historical building protected by the Board of Arts and Culture in Rome recently retrained in 5 star hotel. 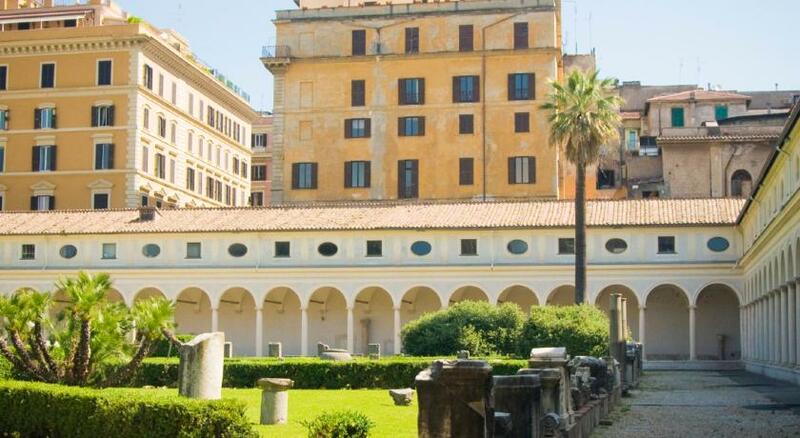 In the garden in front of the entrance are still present Servian Wall, the Roman ruins of the security fence built around the city in the VI century BC that will take you back in history even before entering the hotel. The rooms with high tech details, have all modern decor played on the colors of red and taupe. Each room has a Lavazza a modo mio coffee machine for you to enjoy the real Italian coffee experience right in your room. After a day of sightseeing or work you can choose to relax while sipping a drink on the beautiful terrace with views of Rome on the top floor or, if you are a sporty type, you can use the gym at the hotel. House Rules NH Collection Palazzo Cinquecento takes special requests – add in the next step! NH Collection Palazzo Cinquecento accepts these cards and reserves the right to temporarily hold an amount prior to arrival. 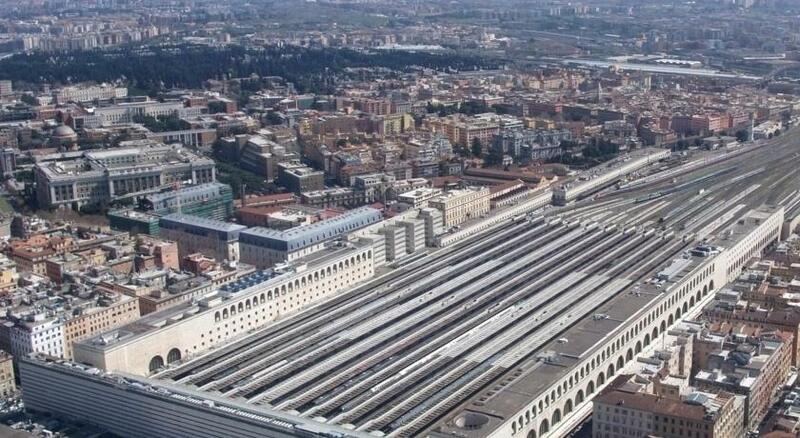 Great location next to Roma Termini, making travel from the airport to here extremely easy. Centrally located and close to many attractions. Very nice building interior and very well sized rooms. We had a great room and were unbelievable happy with it. the people working at the hotel are really nice and helpfull! Water leaked through the door of the shower room, it was not enclosed properly. The breakfast was amazing, I really loved the floor in the room and the overall decorations, was very homely to me. The view outside the window was gorgeous, bathroom was also quite nice, bed was soft and bouncy! Location, helpful reception staff, services. The location was ideal as a base for sightseeing and the staff were so welcoming. Breakfast was not great, I expected more different food rather than scrambled eggs and beans and bacon. Price are seems quite high. Rooms and all facility are very cleaned. Breakfast is excellent when you compare with other EU hotels. I loved that they thought detailed on everythink for breakfast. Location was perfect and staff were friendly. So could be a prefer for all visitors. 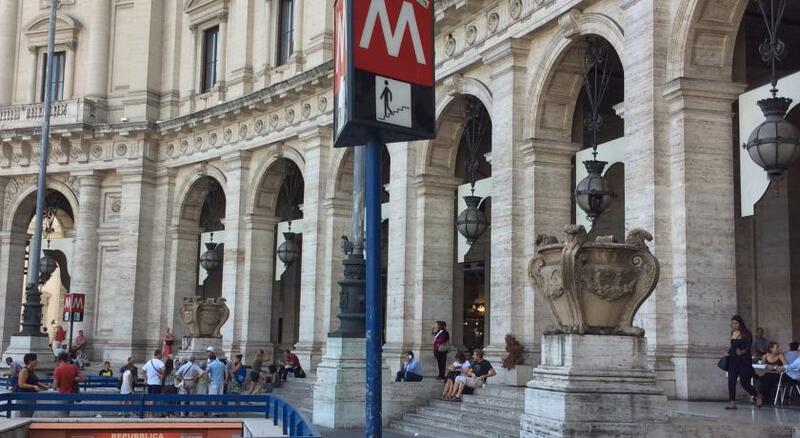 Location is good because the Termini railway station is near - easy to get to the airport or Tivoli, for example. But on the other side it's very dirty district woth lots of homeless. the bed was not comfortable. the room was hot and the ac did nothing to the bedroom. the room service did not clean the room properly as i can see the dust everywhere. the bathroom was neat and clean with a splasher. Location, the bed is too comfy. Room is big and nice.